The first Known written record of Cosby (Cossebi) appears in the Domesday Book of 1086 when it is recorded that 40 families lived in the village compared with about 1400 at the beginning of the new millennium 900 years or so later. Cosby's 'Scandinavian' place name indicates that the village existed here several hundred years earlier, dating to the time of the Danish invasion in the earlier parts of the 9th century. However it is possible that there may have been an even earlier settlement here in Saxon or even Roman times given that the Fosse Way bounds the Parish to the north. 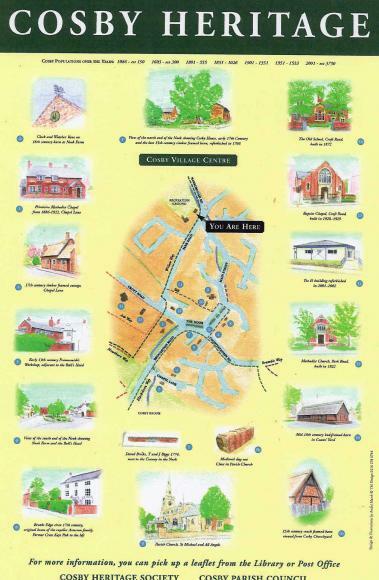 Although no buildings survive from these early periods in Cosby's history there area number of historic buildings still standing in the village. The oldest is the 14th century Parish Church, built in the English Perpendicular style, while the adjacent cruck-framed barn dates from the middle of the 15th century. Close to the church is the early 17th century house known as Brooks Edge. This is the historic home of the Armston family who lived in the village for more than 800 years. One member of this pro-Royalist family escaped after the battle of Naseby and hid out in Whetstone Gorse. Cromwell's soldiers questioned many people as to his whereabouts, including his small son who refused to divulge his father's hiding place. According to the legend this took place in the family home at Brooks Edge and was celebrated in William Fredrick Yeams' famous painting "When Did You Last See Your Father". Another early 17th century building, situated near the north end of the Nook is Cosby House. Adjacent to this is a large late 15th century timber-framed barn, which is one of the more striking buildings in the village. Originally the barn would have been thatched and the walls infilled with wattle and daub. At a later date the infill was replaced with brick and the building re-roofed with Swithland slate. This probably occurred in 1766, the date featured on the south gable end of the barn. In 1767 the medieval open fields of the village were enclosed by Act of Parliament, bringing to an end the system of agriculture, which had been practiced in Cosby from before the Norman Conquest in 1066. The post enclosure revolution in farming resulted in Cosby becoming a more industrial village with framework knitting followed by boot and shoe manufacture dominating the 19th and early 20th centuries. During this period the population of the village more than doubled from 555 in 1801 to 1351 in 1901. Council houses were built along Park Road and in Lady Leys during the 1920s and 1930s, while the Settlement was established in 1938 when 48 houses each with a third of an acre to house out of work families from Wales and the North East of England. By 1951 the population had risen to 1533, five times that of the village in the 17th century. In the 1960s large private housing estates were also built making the village one of Leicestershire's increasing number of dormitory settlements. Today the village has a population of around 3750 and is a thriving community with a growing interest in its heritage and historic roots.